Finslide is a start-up focused on helping individuals manage short-term finances. 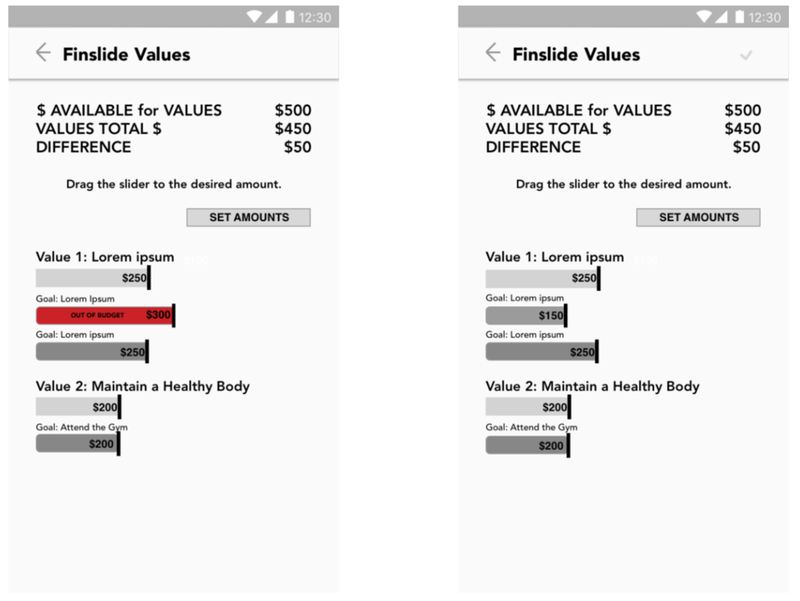 A total makeover of Finslide's first Android app focused on showcasing the company's hallmark: short-term money management through value-based goal setting. With the aide of Finslide, users can organize spending based on life values and goals. To reflect this unique feature a new conceptual model was needed for the existing app. An app design was created allowing users the ability to track weekly income and expenses, while also evaluating money and time spent on achieving set goals. I was the sole designer on the project. Although UX research was not in the project's scope because of rigid time constraints, I conducted limited research independently and produced wireframes. In order to better understand the market, I researched top-rated finance apps. A few apps topped most ranked lists, including Mint and PocketGuard. I evaluated both apps based on usability factors, such as learnability. I also took an inventory of key affordances, such as linkages to bank accounts and social media. I examined the nutrition tracking app MyFitness Pal. Initially, the app was helpful because of its information architecture, but I later used the food diary feature as a model for tracking spending based on values. On post-its I wrote notes, which I organized based on various affinity groups such as links to users' banking system and financial tracking. In moving from data to design, I initially conceived a conceptual model that was task-oriented. I moved towards an object-oriented approach in order to better focus on each component as the basic building block, rather than intricate flows. From the research I gathered I noticed the two prime app features were tracking expenses and managing values and goals. My challenge was creating an experience, including UI, that would balance these two main affordances. I created wireframes that countered the initial design's very busy feel, which also did not cater to a mobile platform. The new design embraced Finslide's mission of approachable financial management by using common mobile design patterns and gestures.